The High Price for Truth | Who has the courage to seek and stand for YaHavah's truth? As long as denominational differences exist, believers are not experiencing true Christian life in the Spirit of YaHavah under the precious blood of Jesus Christ. I can understand the skepticism of trusting a new author. However, I am not new. I have been pushing books and articles for nearly forty years and giving thousands away for free. Then I discovered Amazon’s self-publishing opportunity. I’ve been told more than once that a person will not buy my books. Even when I have sent a free book most will not read it. For those who choose not to purchase my books for whatever reason they have, you should know that there are many more persons who accept my free eBook offers each week or choose to read them free under Amazon’s free reader’s program than those who choose to buy the books. This is a great advantage to potential readers since they can quietly investigate before committing to what the books teach about the Bible. I have faith in the power of the truth and the Spirit. As more and more people come to the realization that YaHavah is strongly urging them to listen to him, more will buy the books for personal and group study. I offer a free Kindle eBook title every week (Mon. thru Fri.) at Amazon.com. To find out the current week’s title, go to http://amazon.com/author/mary_e_lewis. The title being offered will have a $0.00 price. To read the book, you will need Amazon’s free Kindle Reader app available for any device. The percentage of takers of my ongoing free eBook program every week accounts for at least ten times the purchases of the same titles, sometimes more depending on the content of each book offered. Monetary reward for the sales of my books is not as important to me as helping people attain a fresh and deeply rewarding Bible and Spirit perspective of the truth of YHVH and his seven spirits, as they are related to the first and second coming of Jesus Christ and true Christian life. Testing the spirit of all doctrines is commanded in the Bible. I have the following in the first pages of some books and will soon have it in all of them. It is important that readers should know how to test the spirit of what they read to see if it is true to the Bible and Spirit of YaHavah. Testing the spirit of everything to see if it is of YaHavah or the Tempter is essential to protecting salvation. Everything in the following chart was gleaned from the whole Bible but particularly Isaiah 11:1-5 and Proverbs. It was developed for a biblical way of testing the spirit of ALL religious doctrines, including Christian. The chart is also beneficial for testing the spirit of everything thought, heard, and seen in daily life. (This is the THSA process) The contents of this chart are the foundation of this author’s Christian life and writing. The Spirit and Bible are the resources and focus for all testing; not by other doctrines. Study the differences between the upper and lower sections of the chart. Consider the FOCUS and DIRECTION (vertical or lateral plane). If the test is centered on the upper section, then consider the action you will take with a biblical focus. 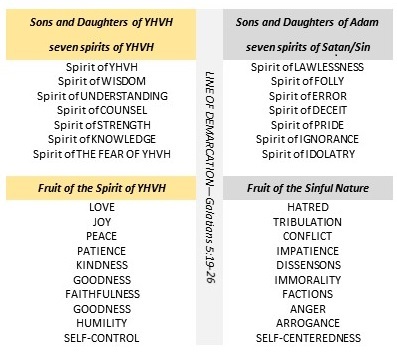 If the spirit, focus, and direction are solely human-related (lower section), further scrutiny is needed to determine if it is a temptation from Satan. If so, immediately cast it out in the name of Jesus. I know I haven’t been very consistent with my blogs, but that is changing right now. I believe strongly in being able to understand the Bible and allowing the Spirit of YaHavah (our Creator) to teach his understanding of it. Each blog will be excerpts from my books. Entries will be identified in parts beginning with Part 1-a. There are more than 6,000 years of history in the 66 books of the Bible; a daunting bit of information to say the least, and reason enough for a multitude of misunderstandings about it. The first 4,000 plus years features the survival of a righteous line of peoples leading to the birth of the Son of YHVH, aka, Son of Man; this is called the first coming of Jesus Christ. The remaining 2,000 plus years is about the survival and subsequent salvation of Jesus’ disciples at his second coming. The Bible is straightforward, says what it means, and means what it says. So in the spirit of truth and simplicity, here is a quick study of what the Bible is about. 4. YHVH’s calendar from beginning to end—Bible chronology and Daniel’s seventy sevens. The stories of the Bible artfully weave bits and pieces about the characters, catalysts, and timing into the sixty-six books of the Bible. It’s pretty amazing that 40 writers wrote 66 books over a period of 2,000 years from Israel’s Wilderness Journey to John’s Revelation of Jesus Christ, and even more amazing that it is perfectly coordinated in context and purpose. If the first Bible I picked up when I was a child had the simple explanations and guidance offered in this booklet, I probably would have become a born-again Christian then rather than many years later. That was around 1948; I was nine. The King James Version (KJV) with only Scripture references on the side or middle columns was the most commonly used Bible version in those days. The KJV contains the Old Testament (OT) and the New Testament (NT) written in 17th century Old English style. Because it contains the OT (Judean or Jewish text) and NT (Christian text), it is also known as the Judean/Christian Bible. The KJV is also the base of most other translations written in modern English, although it was compiled from other versions. Wikipedia presents an interesting history of the Bible at https://en.wikipedia.org/wiki/Bible. We are blessed in this 21st century with a rich and instant source of information contributed by millions of people on the wide world web. I am thankful that I have lived long enough to experience it. However, the knowledge base is wide and does contain some discrepancies. As with anything, approach with caution. In 1947, my family rented a house belonging to a Latter-Day-Saints, aka, LDS, family. They left a small LDS literature library in a built-in shelf unit in which there was a KJV Bible. I was only a child, but I had a deep hunger to find out who God and Jesus were, and since my family did not own a Bible and we were not permitted to discuss the subject of religion, I asked permission to read that Bible. Unfortunately, the Old English style of writing was too difficult for me, and I didn’t get past the first page of Genesis. Any Bible knowledge I received was from Christmas carols, and the Ten Commandments posted in the halls of the schools I attended. I was lucky because after I finished school, people who hate God were instrumental in creating a law forbidding the public posting of the Ten Commandments, especially in schools. When I asked Mama how to respond to other people if they asked me what religion I am, she said I could say Christian or Protestant. She gave me no explanation of what either meant. I wonder now if she even knew the difference and simply repeated what she had been taught. My parents taught my siblings and me right from wrong in a general sense of honesty, integrity, and love. With that said, I was still a Bible illiterate until I accepted Jesus as my Lord and Savior at 40 years of age. Great things can happen at that age; Moses led the Israelites out of Egypt and his successor, Joshua, led them across the Jordon River into the Promised Land. So far, half of my life has been in the serious study of the Bible and passing on what I learn to others in the hope they can become more knowledgeable of Bible truth in the Spirit of Truth. The Spirit of Truth is the key. Until the day I heard the gospel message of Jesus Christ, I had never read the Bible past the first page in 1948. I perused the front pages and learned there were, not one, but sixty-six books in one volume. I could not see how all of the different books were connected. I wanted to know about God and Jesus, but there was much more than that, and there was no indication of how to sort it out. There was no basic instruction on the content and use of the Bible in those days. How could I have possibly understood it without help, since I did not attend church and it wasn’t discussed at home? Frankly, I am thankful that the time for learning came later in my life. I settled in, married young, raised two daughters, and was widowed at the young age of thirty-seven. My eldest daughter is an atheist and activist for LGBT. She knows I cannot stand with her in these choices. It was a battle, but now we accept each other as mother and daughter and leave it there; with a prayer from my side. She is also an activist in educating the public on bipolar syndrome; since she herself is bipolar and overcoming it without prescription drugs. My second daughter is born again and stands with me in the truth of the Bible. Today, even degreed Theologians mentoring and working together haven’t really understood the Bible. I don’t say this to attack them. They are simply repeating what they’ve been taught. The danger of a status quo state of mind is that it blocks the hearing of the truth that comes from the Bible. They know about the people and their history, but most of them don’t know the Judean/Christian Bible by the Spirit of Truth. Theologians are well-versed on the human failure of attaching alternatives and diversity to their understanding of the Bible, though they do not see this way of thinking as a failure. More on this later, also. What are my qualifications for what I write about the Bible and Christianity? I follow the one and only golden rule; love YHVH with all your heart, mind, and strength and love your neighbor as yourself. It is the first step to becoming born again. I understand the Bible because my teacher is the one who inspired it. The Bible says YaHavah is our teacher. I not only believe it; my writing is proof of it. Theologians and ministers will say that, too, but their fruit says otherwise. It’s that time of the year when the world celebrates the birth of Jesus by giving gifts. But there is more about Jesus than gift giving. Actually, Luke’s account of Jesus’ birth puts it at about February. All the details of why are in my Word of YHVH Bible in Luke’s gospel. All who believe in Jesus should be celebrating his birth and death at the same time, during the Hebrew Feast of Passover. Then at Pentecost, celebrate the outpouring of the Spirit of YaHavah. (Rev. 5:6) At the Feast of Ingathering (Harvest), we can all celebrate the promise of Jesus’ return and give him glory. Notice how the three main Feasts of YHVH center on the milestones of Jesus’ first and second comings, because Jesus came to fulfill the prophets and the Law. I know these Bible technicalities put a shadow over the tradition of December Christmas, but isn’t it a better thing to celebrate Jesus in accordance with YaHavah’s commandments and purpose? Really, it is a life or death choice. The (who’s) of reporting are the protagonist and antagonist. Bible protagonists are our Creator, YHVH and His Son, Jesus. Antagonists are Satan, aka, Lucifer the fallen angel, and his earthly counterpart, the end time Antichrist, aka, Daniel’s fourth beast. The (when) begins in a time before creation as we know it and ends with a new creation. The spiritual (where) is in the hearts and minds of humanity and our Creator, YHVH. The (how) is in the causative actions of the unseen infinite, omnipresent, omnipotent, and omniscient YaHavah. From his place in heaven, his mind (spirit of YaHavah) reaches everything and everywhere without limitations. The (why) is to remove sin from YaHavah’s creation. You might wonder why I listed Satan as first under YHVH. Satan existed before the others; it does not mean he is above any of them, only before them. Because of Satan, the last one is essential. Adam failed to test the spirit of Satan’s temptation, and look where we are now. Isaiah 14:12 names this fallen angel, heylel it was translated to Lucifer because of his brightness, like a bright morning star. On earth, he became known by the name sâtân, pronounced saw-tawn, meaning opponent or adversary. Heylel aspired to have YaHavah’s throne, so, he tempted one third of the angels in heaven to turn against YaHavah. There was war in heaven and he and his rebel angels were ejected from YaHavah’s presence. Now we must deal with him every day of our lives because of the sin he brought into the world through Adam. The law helped identify sin for a time. Then YaHavah obeyed his own law of requiring a perfect blood sacrifice to atone for Adam’s sin. All human fathers are tainted with Adam’s sin, so at his appointed time conducive to fulfilling all of his prophecies, YaHavah created a perfect male sperm to conceive his son in the womb of a faithful maiden. Then he named his son Jesus. Jesus is the sinless Son of YaHavah who came to fulfill all righteousness in the law and prophets. Jesus gave his life so we can overcome Adam’s sin in us and overcome Satan’s temptations to destroy us. Salvation is not automatic. By your choice to accept the free gift of Jesus’ atoning death on the cross in your stead, YaHavah will write his laws on your heart so you can know and obey him. It means YaHavah, who inspired Moses to record the law, can be present, in you by his own infinite Spirit, to implement his commandments through the shed blood of Jesus. Believe in and love both, Jesus and YaHavah, with all your heart, mind, and strength. This is the simplicity of Christ. Christ means to be anointed in the Spirit of YaHavah. Jesus is Daniel’s prophesied anointed Holy One. All who give their life and love to YaHavah and Jesus bear the identifying name of Christian. Satan’s entire plan is to alter the Bible’s truth about YaHavah and Jesus to turn humans against YaHavah. The traditional December Christmas story is one of Satan’s lies. Believing strange doctrines about the Bible and YaHavah is the same as hating and going against YaHavah. Satan is very good at being a smooth-talking deceiver. 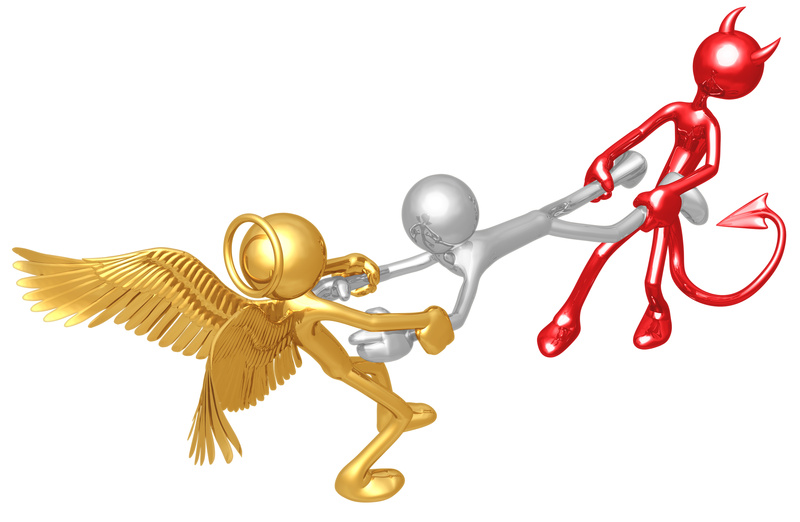 Let’s face it, anybody who can turn angels against YaHavah is extremely dangerous. He is the master con artist. He is the God of all who believe his lies, and honors him in their statements of faith, by mixing his lies with some of YaHavah’s truth to make the lies palatable, or seem so. Satan can present himself with charisma or terrorism, whatever suits his purpose and the willingness of his targets, day or night. Acquiring full Bible knowledge of YaHavah, will assure those who love Jesus and YaHavah, of their right and knowledge, to determine the truth or falsity of any doctrine, and to confront any temptation from Satan with confidence in the truth of the original Scriptures. Choose your Bible with care, because denominations publish slightly altered Bibles to accommodate certain false doctrines they believe to be truth. “The Word of YHVH Bible” and its paperback edition “Water of the Word” are not denominational. Follow Jesus’ example. He loves YaHavah with all his heart, mind, and strength, was anointed in YaHavah’s Spirit at the beginning of his ministry, then he overcame Satan’s temptations by proclaiming YaHavah’s truth. He gave his life that we may live in peace with YaHavah. Have a blessed life in Christ. Click HERE for more information. Available in Kindle and paperback.